After parking at my usual lunch time portable operating position, and not hearing much on the bands, I decided to do something I had been wanting to do for awhile now. 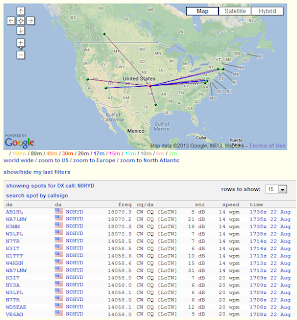 I have been wanting to play around with the Reverse Beacon Network using my portable QRP antenna. When not hearing much on the bands, I wanted to see if there was just not many operators, or if the band was actually dead. The other thing is that many times when I call CQ I call at less than 15 wpm because that is where I am most comfortable. 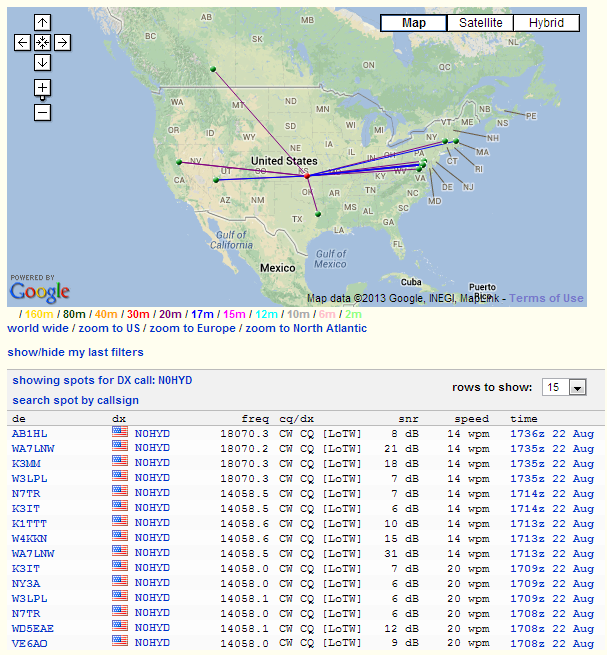 I have never seen many reports on RBN in the past when calling CQ so I wanted to see if speed made a difference. So I started off with 20 WPM and called CQ for about 3 minutes on 20 meters. You can see the spots on the photo, but I was heard mainly to the East coast and West part of the country - and one Canadian station. Then I went down to 14 WPM and called CQ again - as you can see on the photo. At 14 WPM, my signal was still decoded and I got spotted by 5 stations. Where at 20 WPM I was spotted by 6 stations. So not really much difference. I did change frequency so that it would show the new spots. I didn't call as long at 14 WPM because I heard someone answering! KO4OP - Rick was answering my CQ and had a nice sounding signal. He was in King William, VA. He was 599 and he gave me a 559. We went on to have a nice 15 minute exchange - really nice QSO Rick! Thanks for giving me a call! As you can see in the picture I then went to 17 meters and put out a CQ at 14 WPM and was spotted by 4 stations (3 on the east coast and one out west). I did hear someone call ..__.. (?) after one of my CQ calls but I never could reach him, and they never gave a call. After this I did hear NE1SJ very, very weakly calling from a SOTA summit on 20 meters. I gave him a call and he heard me, but when he came back he got weaker and I just could not pick him out of the noise. Sorry we couldn't make it today - I would have liked to pick up some more points! It seems my SOTA chasing has stalled a bit. Lately 20 meters seems to be skipping right over me here in Kansas! So the RBN site was fun to play around with. It just tells me that even when you don't hear anything, it doesn't mean that you aren't getting out! Put out some CQ's and have some fun!